Only 30,135 Miles! Scores 32 Highway MPG and 21 City MPG! 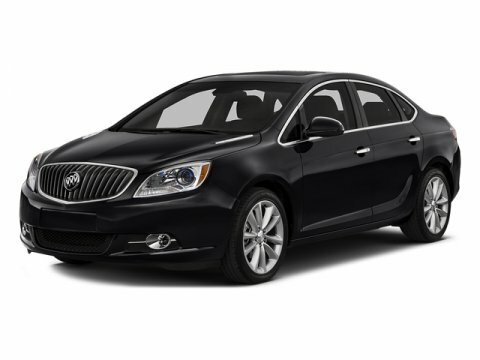 This Buick Verano delivers a Gas/4-cyl 2.4L/145 engine powering this Automatic transmission. WHEELS, 18" X 8" (45.7 CM X 20.3 CM) MULTI-SPOKE MACHINED ALLOY with Sterling Silver finished pockets (STD), TRANSMISSION, 6-SPEED AUTOMATIC, ELECTRONICALLY CONTROLLED WITH OVERDRIVE includes Driver Shift Control (STD), SUNROOF, POWER, TILT-SLIDING WITH SUNSHADE (Included with (PDU) Experience Buick Package.}. * This Buick Verano Features the Following Options *LICENSE PLATE FRONT MOUNTING PACKAGE, EXPERIENCE BUICK PACKAGE (Includes (WBP) Appearance Package and (CF5) power tilt-sliding moonroof. ), APPEARANCE PACKAGE includes (T2X) Chrome front bumper grille and (T43) rear spoiler , SEATS, FRONT BUCKET WITH SEATBACK MAP POCKETS (STD), FRONT BUMPER GRILLE, CHROME, ENGINE, ECOTEC 2.4L DOHC 4-CYLINDER SIDI (SPARK IGNITION DIRECT INJECTION) with VVT (Variable Valve Timing) (180 hp [134.28 kW] @ 6700 rpm, 171 lb-ft of torque [230.85 N-m] @ 4900 rpm) (STD), EBONY, PREMIUM LEATHER-APPOINTED SEATS, EBONY TWILIGHT METALLIC, AUDIO SYSTEM WITH NAVIGATION, AM/FM/SIRIUSXM STEREO, SINGLE CD/DVD PLAYER AND MP3 PLAYER WITH NAVIGATION IntelliLink with 7" diagonal touch-screen display, GPS navigation system, USB port, Radio Data System (RDS) and auxiliary input jack, includes phonebook access, voice recognition for audio, phone, phonebook and music selection, Pandora and Stitcher Smartphone compatible, SiriusXM weather and data services, and software Bluetooth and Smartphone interface upgradeable, 1SL PREFERRED EQUIPMENT GROUP Includes Standard Equipment. * Stop By Today *Stop by Bleecker Buick GMC located at 926 E 4Th Ave, Red Springs, NC 28377 for a quick visit and a great vehicle!